Made in the USA, Ecos offers a unique collection of traditional interior and exterior paints as well as specialty paints preferred by people with Multiple Chemical Sensitivities, allergies and asthma. Ecos paints are in a class by themselves. They are considered to be organic paints because of their purity and ultra-low odor, yet they perform as well or better than any leading brand in terms of coverage, opacity and colors. After months of testing ECOS primers and paints, we experienced no odor, exceptional coverage, excellent hiding ability and excellent durability. In fact, we've found Ecos products to be as safe or safer than any paint we've ever used. Many of our customers who have used other brands of zero VOC paint say this is as good as it gets. Ecos started in the UK 25 years ago and has been formulating and manufacturing paints for the European market. 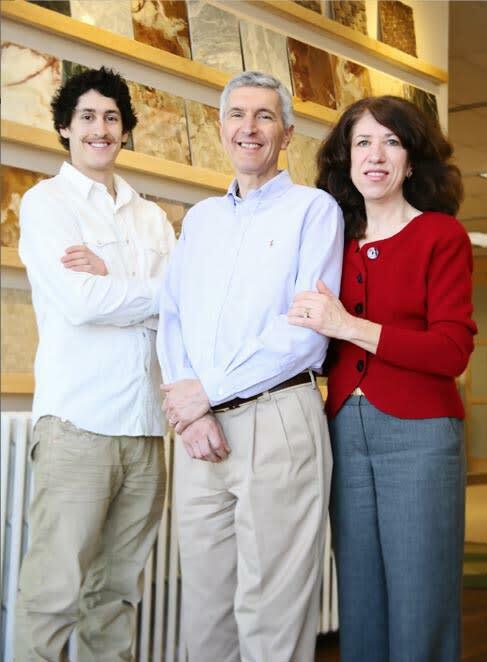 Their company started the way many of the companies we represent started--with a passion to make the safest products available for children and those challenged by asthma, allergies and chemically sensitivities. They make paint that is truly non-toxic and zero VOC like Mythic and AFM but with some major differences. FIRST, they make their own paint. Unlike many small to mid-sized paint companies who outsource their production to larger paint manufacturers, Ecos sources and manufactures their paint and pigment in-house. Obtaining natural and synthetic products can be challenging as suppliers often move or change their sources which can affect the quality of paint. By sourcing and making everything themselves, they have control over their products which ensures reliable and consistent quality from batch to batch. Ecos manufactures a complete line of primers, interior and exterior paint in matte, eggshell, semi-gloss and gloss sheens. They can color-match almost any major paint manufacturer's paint and provide small 2 oz samples that make it easy and inexpensive to test. They also offer a number of specialty paints such as Air Purifying paint that purifies the ambient air (see below), Porch paint, Radiator paint and Chalkboard paint. 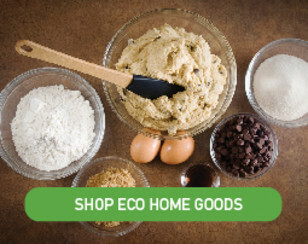 SECOND, Ecos uses only safe ingredients. ECOS has become the first and only paint manufacturer to to fulfill the requirements of DECLARE and to be Red List Free. 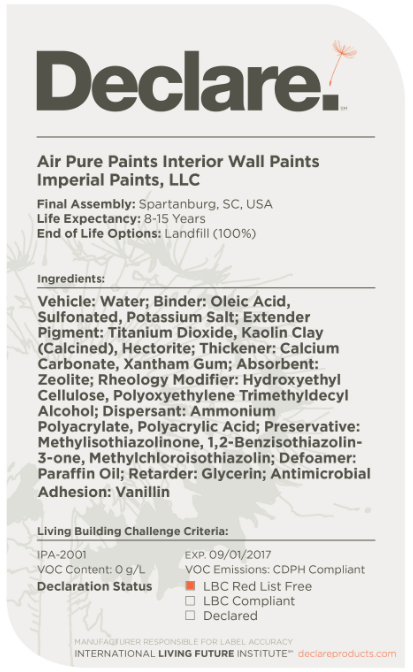 The DECLARE LABEL developed by The International Living Future Institute (ILFI) in Washington, requires manufacturers of building materials to list 100% of all their ingredients — even proprietary ones on their label. It's about time! The ILFI has also created a "Red List" of thousands of hazardous chemicals (VOCs as well as non-VOCs). If a product does not contain any ingredient on that list, it receives the highest ranking of "Red List Free." As you might expect, not many companies wish to participate because exposure of all their ingredients would reveal trade secrets. But more importantly, it would unveil the truth which may not be as rosy as they claim. ECOS was also the FIRST North American paint manufacturer to complete the third party verified Health Product Declaration (HPD) for LEED v4 and the only professional grade paint certified to ASTM D-4236. Test certificates, in the form of downloadable pdf, can be found by visiting the specific product page on the right hand margin of our website. 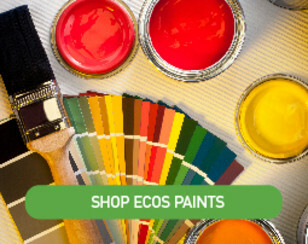 In addition to their traditional paints, ECOS Atmosphere Purifying Paint, made with Zeolite, has the ability to eliminate chemical and organic odors such as VOCs, smoke and pet smells from the environment. Atmosphere Purifying Paints are engineered to trap and adsorb a specific range of VOCs from the atmosphere, using an advanced molecular sieve that filters and purifies the environment of harmful contaminants. For use where clean air is needed the most, Air Pure Paints improve the environment for patients, the chemically sensitive and research laboratories. Air Pure Paints contain a zeolite molecular sieve to trap specific common VOC contaminants, such as formaldehyde, from the air. The sieve structure (a non-toxic crystalline tube) is sized to allow small molecules such as nitrogen or oxygen to pass unimpeded, while larger molecules (organic compounds) are trapped. 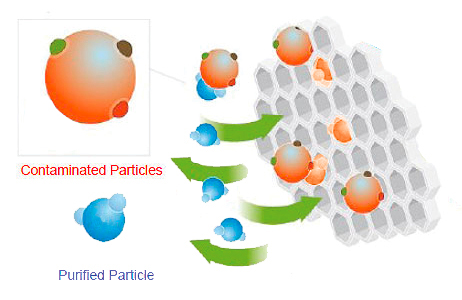 Over time, Air Pure Paints filter the indoor air, reducing the level of pollutants. When saturated (after three years in a typical environment) a fresh coat of paintcan be applied. With twenty five years of experience and positive results, providing product and services to the chemically sensitive, healthcare industry and homeowners, Air Pure Paints is a proven technology in the real world. The following contains technical reading, but for those of you who love to research products, you should find it useful. 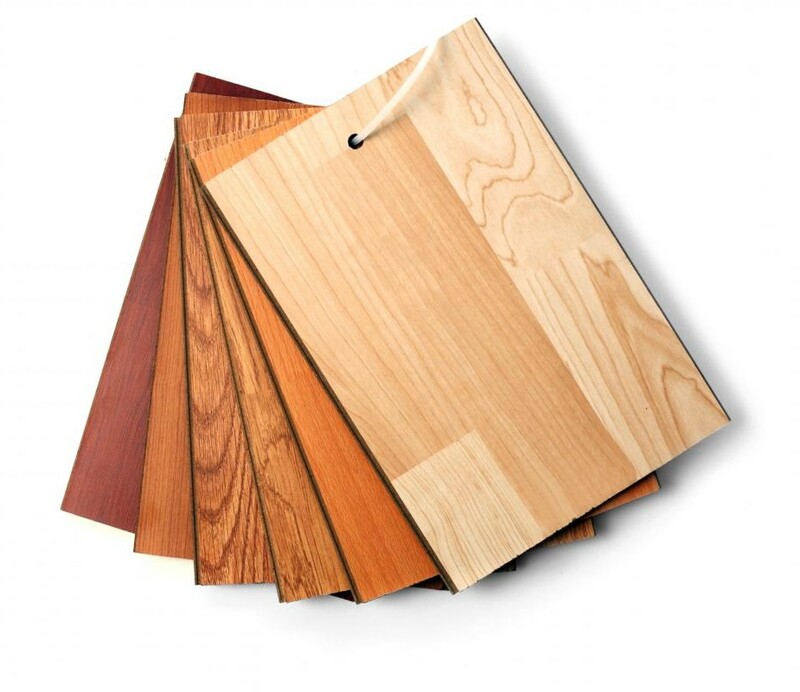 A DECLARE label, administered by the International Living Future Institute (ILFI), is a voluntary manufacturer's disclosure statement of the ingredients contained within a building material. The Declare label is similar to a Material Safety Data Sheet (MSDS) but with much more transparency. It requires complete disclosure of all ingredients, even if proprietary, as well as the sources of the ingredients and options for the end of their useful life. The ILFI has created a Red List Chemical Guide which includes all known dangerous chemicals. Products with Declare labels that contain no ingredients on the Red List are awarded the highest status of Red List Free. 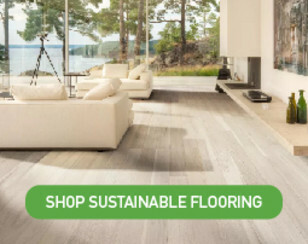 In addition, they must be certified by third party organizations such as SCS Indoor Advantage Gold, FloorScore, Collaborative for High Performance Schools (CHPS), National Science Foundation (NSF) or UL Greenguard Gold. While there are a few exceptions to this high standard, only those that require no exceptions will achieve the Declaration Status of Red List Free. The standard test method for determination of the weight percent individual volatile organic compounds (with an initial boiling point of less than 250°C) in waterborne air-dry coatings by gas chromatography. This test reports VOC content, with a minimum recordable threshold of less than 1 g/l, which would be considered zero. ASTM states that this test is about ten times better than EPA Test Method 24 and that the test performance, compared with EPA Test Method 24, improves further as the VOC content approaches zero (as with our coatings). EPA Test Method 24 allows for 5 g/l VOC content for a “zero” VOC product. Differences between test methods can include, for example, chemicals like Texanol6 (an ester alcohol described as the premier coalescent for latex paint) which has an initial boiling point of 254C and is variously recorded as a VOC and not a VOC for individual test methods. Our products do not contain Texanol. An example of our test results for ASTM D6886 can be found here. Test results for individual products can be found on their respective product pages. This method determines most volatile organic compounds with boiling points below 200°C by gas chromatography/mass spectrometry (GC/MS). Method 8260 is used to determine volatile organic compounds in a variety of solid waste matrices. This method is applicable to nearly all types of samples, regardless of water content, including polymeric emulsions. The test identifies sixty six specific compounds, including some of the most problematic chemicals commonly found in paints such as: benzene, chlorobenzene, methylene chloride, styrene, tetrachloroethene, toluene, vinyl acetate, vinyl chloride and xylene. In addition to these named compounds, Method 8260 can be used to quantitate most volatile organic compounds that have boiling points below 200°C. Using standard quadrapole instrumentation and the purge-and-trap technique, measurement limits are approximately 5µg/kg and paint can be analyzed in its wet form. An example of our test result for EPA Method 8260B can be found here. Test results for individual products can be found on their respective product pages. This test applies to many children's toy products such as crayons, chalk,paint sets, modeling clay, coloring books, pencils, and any other product used by children to produce a work of visual or graphic art. The test is to determine the absence of substances which have the potential of causing a chronic hazard. The designation "conforms to ASTM D-4236" means all of the potentially hazardous components of the product have been clearly labeled on the product packaging. Some common components, such as solvents, cause allergic reactions or are dangerous if they touch the skin or the eyes, others can cause respiratory problems if over-inhaled. The ASTM D-4236 standard requires these components to be listed on packaging, and assesses a product for toxicological expectations. The ECOS test results (which include the pigments too) showed no expectation of oral toxicity, skin irritation, respiratory tract irritation, corrosion, or chronic toxicity. California Department of Public Health Test 01350. Standard method for the testing and evaluation of volatile organic chemical emissions from indoor sources using environmental chambers.9 This test is performed on samples which have been allowed to “cure” for a period of fourteen days at which time they are tested for emissions – which are categorized as total VOCs, target VOCs (which are considered more harmful) and aldehydes (including formaldehyde). Performance requirements include a limit for the total VOCs measured, with specific upper thresholds for VOCs which are considered to be of concern. This test measure is better suited to new construction where buildings could remain unoccupied for several weeks following completion, and where VOCs would be able to disperse before the building was inhabited. For renovation projects, where a building will be occupied either during, or shortly after work is completed, emissions measured at fourteen days are less helpful – particularly as many products have peak emissions as they are applied and dry. The ECOS test results (which were all a pass) showed no measurement of the chemicals of concern and trace levels of additional VOCs - which it is recognized can be introduced as part of the product handling and the test process which requires the introduction of air that is known to contain a limited amount of VOCs. An example of our test result for CDPH 01350 can be found here. European standard EN 71 specifies safety requirements for toys. Compliance with the standard is legally required for all toys sold in the European Union. The standard has been published in 13 parts, with EN 71-3 relating to the total migration of toxic metals (Arsenic, Mercury, Selenium, Barium, Lead, Antimony, Chromium, and Cadmium) in a material to determine if it is safe for use in children’s toys – which could be chewed, or placed in a child’s mouth. ECOS products were shown to be suitable for use in children’s toys with respect to EN 71-3. 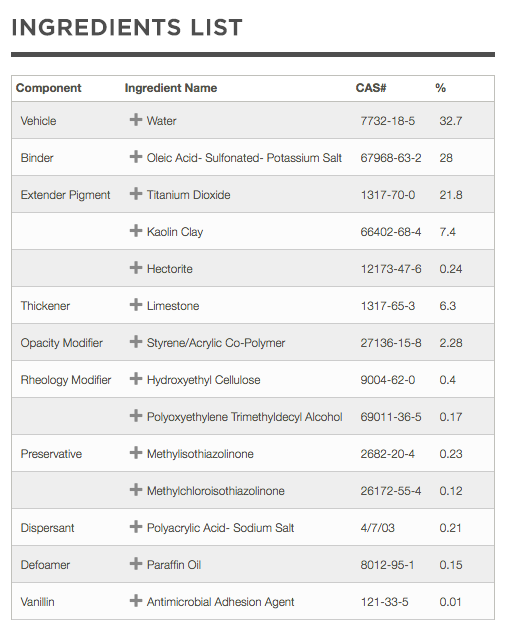 Test results for individual products can be found on their respective product pages. The Juvenile Product Manufacturer’s Association (“JPMA”) is an organization dedicated to promoting the industry and the safe use of juvenile products. It offers a stringent certification and approval process, for determining the suitability of products for use by and around juveniles. The Juvenile Products Manufacturers Association (JPMA) is a non-profit association representing approximately 250 manufacturers who make 95 percent of the prenatal to preschool products in the U.S. market. Each of the JPMA Certification Programs is foundationally built on an ASTM standard with federal and state requirements layered on, as well as many of the major retailer requirements. The British Allergy Foundation evaluates products through testing carried out by independent laboratories to protocols which have been created for the Seal of Approval by leading allergy specialists, specifically to benefit the sufferers of allergy, asthma, sensitivity, and intolerance. The main endorsement is a seal of approval which provides the reassurance that a product has been scientifically tested to prove it is efficient at reducing/removing allergens from the environment of allergy and asthma sufferers or the products have significantly reduced allergen/chemical content. Testing is carried out by an independent laboratory.